This giveaway wrapped. For details on the winner and what she received, view her article. Once this website gets 100 followers from fellow bloggers and/or email subscriptions, I will be doing a giveaway. I post almost every day and at times twice a day, so I suggest signing up for weekly updates instead of daily. It will consist of samples I’ve picked up from: subscription boxes, Department Stores, Sephora, Ulta, Beauty.com, Target, and more. My plan is to tailor the box to the winner as much as possible. They will all be unswatched, new items. When you shop as much as I do, you are bound to collect more samples and GWPs than you can use. It will be determined via random number generator. I will assign a number to each comment starting with oldest first. 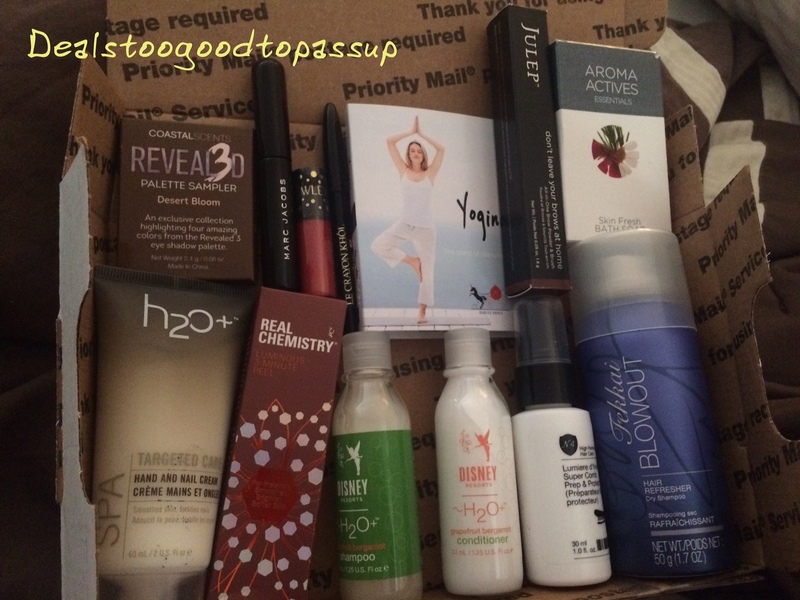 I prepared the following box for a Beautytalk user at the beginning of January 2015. It included: Agave Oil Treatment (love this), Juice Beauty CC cream in Natural Glow (love this), Amika Dry Shampoo (new to me), em full-sized liquid foundation (like this), Peter Thomas Roth Shampoo and Conditioner (like this), Lancome BiFacil (my absolute favorite makeup remover), Benefit Porefessional (love around my larger pores only), Peter Thomas Roth moisture Infusion Facial Bar (like this for my body only), Hanae Mori Butterfly (nice scent), Givenchy Very Irresistible (smells good), Urban Decay Anti-Aging primer (like this), Lancome Hypnose Drama Mascara (like this), Lancome Le Crayon Khol (like this), GlamGlow Bright Eyes (love this), Benefit Sun Beam (very pretty glow), and H2o+ Oxygenating Rejuvenator (love this). Are there any items you want to try? List a few in your comment. If I have any available, I will include it in the box if you’re selected. I will contact the winner via email to notify him/her and ask for the mailing address. I will also ask some basic makeup and skincare questions, so I can tailor the box to the winner as much as possible. The winner will have seven days to respond before I draw a new winner. Winner must reside in the US, Canada or Mexico to qualify. The site may take some time to build up an audience, so it may take a while to conclude this promotion. As long as the site reaches the goal, the giveaway will take place. Odds of winning depend on how many people subscribe and comment as entries require both. If all subscribers enter the contest, the odds will be 1 in 100. Good luck! I decided to do a special giveaway for another Beautytalk user toward the end of June 2015. This is the box I put together for her. Again, this is an example of items I may include if you win this contest. She received: Coastal Scents Reveal3d in Desert Bloom (love this), Marc Jacobs mascara (reviewed well), Cythnia Rowley Poppy (love this), Lancome Kohl eyeliners (love this), Harvey Price Yogini (like this), Julep Leave Your Brows at Home (like this), Aroma Actives bar (standard bar sap), H2o+ Targeted Care Hand and Cuticle Cream (love this), Real Chemistry Luminous Three Minute Peel (love this), h2o+ shampoo and conditioners (reminds me of Disney), No4 Protect and Comb (new to me), Fekkai Dry shampoo (new to me). She did not give me any product or skin concerns when creating this box. The winner must be a website subscriber at the time of the giveaway, so those who subscribe but drop are not eligible. Subscribe with the same email used to comment, so I can track followers please. S/he must also reply to this post, and agree to let me announce his/her first or user name on the site. To subscribe, click the option on the right tab of the main page. If the number I draw from the comments is not a website subscriber, I will draw again until I draw a subscriber. Your thread is one of my faves at BT – love the expanded site! Ive never heard of em foundation, but Im willing to try it out! Yay to 100 followers! Em is a line launched by Michelle Phan and is owned by the Loreal brand. Its price point lies between Loreal (drugstore) and Lancome (mid range). It is only sold on the em site at the moment. After I mail the em foundation, I do not have any more new ones. The box pictured was an example of items that may be in this one as these specific items are already claimed by the recipient I am mailing them to. Thus, the award box for this site will definitely not contain em foundation. I do plan on tailoring the box to the winner as I tailored this one to its recipient. Once I draw the winner, I will send him/her an email asking questions to get a slightly customized box. I will post the final box along with the winner’s first or user name once we reach our goal. Good luck. Thank you. I am glad you love the site and the thread as I hope to keep both going. Good luck. You’ll have 100 followers before you know it. I’m excited for you! I just got your subscription notification, so I came back to say good luck. Great site! I follow your thread on BT and am glad to see you use your knowledge to create your own blog. The way you set up links to sections a person might be especially interested in is a great idea. I have you bookmarked and ck daily. Here’s to the magic 100 number! What a great idea! Found you on Sephora BT. My favorite samples are makeup, especially lip products and eyeliner minis. Good luck on your new endeavor! Sorry if this is a double post. Found you on Sephora BT and thanks for all you do there! My favs to try are lip products and eyeliner minis. Good luck on your new endeavor! Thanks. No worries. All posts are welcome. I appreciate the feedback. Love your site, this is AMAZING!!!!! Thanks. Don’t forget to subscribe, so I can enter you into the drawing. Thanks for this – so glad I found the site! What a great and helpful idea, keep up the good work for us ;). I’m really appreciative of all the hard work you’ve put into this page! It looks fantastic and is such a great resource, even if dangerous to my wallet! Thanks! I love your name. Good luck. I love your thread on BT and am now following your Facebook page too! Keep it up! Thanks. There are a lot of great contributors that keep the thread going. Do not forget to follow here as well, so I can enter you into the drawing. The follow option is in the right margin of the main page. Love your site and look for your posts on BT! Thanks for the hard work and for being so helpful! Thanks! Do not forget to follow along here, so I can enter you into the drawing. Also, not 100% if I got subscribed or not. I’m super computer illiterate. Email me if it doesn’t work! Yes, I see your subscription, so you are entered into the drawing. Good luck. Thanks so much. Good luck. Nice blog! I’m sure you’ll be at 100 followers soon. Hi! I’m following your BT thread (one of the best threads!!) and am now signed up for this blog. It’s so easy to navigate. Great job! Idk what took me so long to come on over? Hmm. In answer to your question, I think the Juice Beauty, Agave and Lancôme Khol. There’s so many great items. Idk if the EM will be light enough for my white as paper skin tone. LOL. Hi!i thought that I commented, but I refreshed it and it wasn’t there. So, I’m very sorry if it ends up being a double post? I’m subscribed to this thread as well as the BT thread. I also signed up for the Rouge Institute, but have not had a chance to play around on that site yet. Hmm. To answer your question, I’m most interested in the Agave, Juice Beauty and the Lancome Khol. I was going to say the EM foundation, but it won’t be in the box and it probably wouldn’t match my paper white skin tone. So, all is good! Thank you for doing so much work to help others get great deals. It is truly appreciated! Take care! Thank you. I see your subscription via email and blog sign up, so good luck with the drawing. Yes, The ladies at The Rouge Institute are fabulous. You will like it there. I moderate posts before they go up, so they do not go live until I see them. Thanks so much for following. Good luck with the drawing. If you win, I will see what I can do to accommodate your request. I may have another Agave and definitely have another Lancome Kohl (different color). I think I am out of Juice Beauty, but I could pick up another before the contest ends. But, no worries. I have hundreds of brand new goodies. i’m really enjoying the content and sweet deals on this site! Your site is really wonderful! I wish you all the best. It is really nice to see a bunch of BTers here supporting one of our own! Thanks. I’ve met a lot of great people on BT, so I am happy they’ve checked this out. Good luck. Thanks for doing this – the site is awesome! This is so exciting! I’ve been entering all the contests you’ve put up on here. You’re doing a great job.